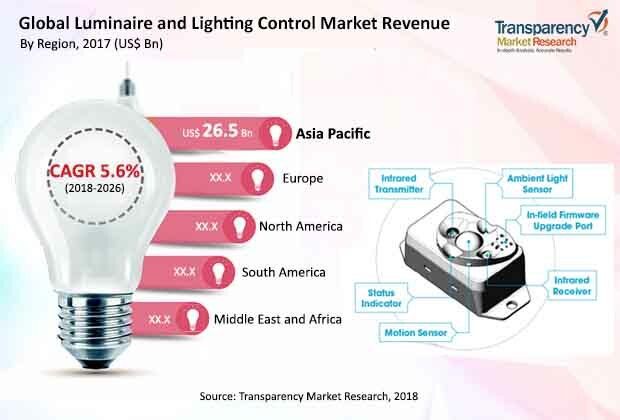 According to a new market report on luminaire and lighting control published by Transparency Market Research , the global luminaire and lighting control market is expected to reach US$ 111.0 Bn by 2026, expanding at a CAGR of 5.6% from 2018 to 2026. According to the report, the global market will continue to be influenced by a range of macroeconomic and industry-specific factors. Asia Pacific will continue to be at the forefront of global demand, with the market in the region expanding at a CAGR of 6.0% during the forecast period. As energy costs continue to rise, demand for energy-efficient solutions is increasing rapidly, especially in the U.S. In line with the same, many utilities and city governments are deploying LED-based lighting control systems with advanced technology to enhance efficiency and reduce operation and maintenance costs. This has led to rise in adoption of LED- based lighting products and systems. The global luminaire and lighting control market is broadly segmented by product, light, technology, component, application, and region. In terms of product, the market is classified into luminaire and lighting control. The luminaire segment is expected to hold significant market share of 91.2% in 2018. Based on light, the market is categorized into LED, halogen, fluorescent, HID, and others. The LED segment constituted a prominent market share in 2017 and is anticipated to dominate the market during the forecast period owing to increasing adoption of LEDs in multiple applications. In terms of technology, the market is segmented into wired and wireless. Based on component, the market is divided into hardware, software, and service. In terms of application, the market is segmented into indoor and outdoor. The commercial sub-segment of the indoor segment is anticipated to dominate the market owing to upgrade of existing products in commercial spaces with a focus on achieving energy efficiency goals and increase in productivity through lighting control. The roadway lighting sub-segment of the outdoor segment is anticipated to be dominant constituting market share of 35.4% in 2026. Asia Pacific dominated the luminaire and lighting control market in 2017, with China accounting for a prominent share of 43.1%. The dominance of the market in the region is attributed to its large population base, rapid industrialization and urbanization, expansion in the lighting industry, and increased penetration of wireless devices. China is anticipated to lead the luminaire and lighting control market in Asia Pacific throughout the forecast period. This is mainly because it is a major manufacturing hub of lighting products. Apart from China, countries such as India and Japan are also expected to contribute significantly to the market in Asia Pacific. The market in India is expected to expand at a CAGR of 6.9% during the forecast period. This is mainly due to smaller cities, towns, and villages with smart street projects and increased usage of LEDs. North America and Europe collectively held 51.8% share of the global market share in 2018.